DENVER, Colo. (Embargoed until 11 A.M. MT, Wednesday, June 14, 2017) –Simultaneous injections of the radiopharmaceuticals fluorine-18 fluorodeoxyglucose (18F-FDG) and 18F-sodium fluoride (18F-NaF) followed by quantitative scanning significantly improves image quality and detection of bone metastases at a lower dose, according to research presented at the 2017 Annual Meeting of the Society of Nuclear Medicine and Molecular Imaging (SNMMI). “For certain patients with breast and prostate cancer who require evaluation of metastatic disease, a single PET/MR exam can provide more accurate information with less radiation dose in one procedure that is more convenient for patients and potentially less costly for the healthcare system,” said Andrei Iagaru, MD, associate professor of radiology and division chief, Nuclear Medicine and Molecular Imaging, Stanford University School of Medicine in Stanford, Calif.
Dual-agent PET/MR is further supported by time of flight, a quantitative feature of modern PET image reconstruction that approximates the position where photons are created as radioactive agents decay, which translates into finer image quality. For this study, researchers prospectively enrolled 55 cancer patients—39 men with prostate cancer and 17 women with breast cancer, ages 34 to 85, in line for conventional bone scan to determine the spread of their disease. All participants were administered simultaneous injections of the imaging agent 18F NaF for the evaluation of bone turnover and FDG for increased metabolic activity and/or inflammation. After injection, scientists performed PET/ MRI scans with time of flight capability and compared the results with conventional technetium 99m-methyl diphosphonate (99mTc MDP) bone scintigraphy. Results of the study showed improved detection of prostate and breast cancer that had metastasized to bone. Dual-agent PET/MR pointed to bone metastases in 22 patients who were also found positive for metastases with conventional bone scan. In addition, PET/MR detected more bone metastases in 14 patients when compared to the conventional bone scan, which caught only one lesion that was not detected by PET/MR. Researchers concluded that PET/MR found a greater extent of metastases and, as an added benefit, significantly reduced the required radiation dose from the injected agents—80 percent less from 18F-NaF and 67 percent less from 18F-FDG. 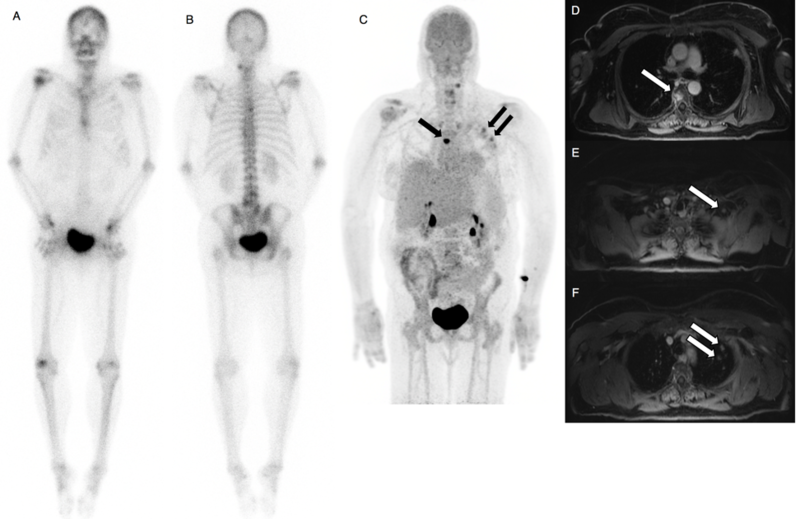 Scientific Paper 755: “Imaging Patients with Breast and Prostate Cancers Using Combined 18F NaF/18F FDG and TOF simultaneous PET/ MRI,” Ida Sonni, Shreyas Vasanawala, Andrei Iagaru, Ryogo Minamimoto, Valentina Taviani, Negin Hatami, Sanjiv S. Gambhir, Radiology, Stanford University, Stanford, Calif., SNMMI’s 64th Annual Meeting, June 10–14, 2017, Denver, Colo.